N.Y. dancehall star Kranium has risen with the tide of "Nobody Has To Know" to unexpected heights over the last three or so years. Today he released his major label debut Rumors, which of course includes "Nobody Has To Know," as well as "Stamina" and a number of new (and largely Ricky Blaze-produced) exceptionally buoyant joints. The album opens, however, on a more tender note with the LMR Pro-produced "Between Us." "It really sets the mood for Rumors, which I often say plays out like a soap opera," Kranium explained in an email to The FADER. 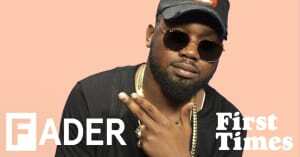 Accordingly, the song's accompanying video borrows tropes from daytime dramas, beginning with Kranium sweeping away a girl in his jeep and ending with breakfast at his place. Meanwhile, he sings: Every message girl you get, kindly delete it. Watch "Between Us" above; cop Rumors now; and if you are in N.Y. this weekend, pop by The FADER FORT on Saturday night.